On our first day in San Jose, after getting situated at our hotel, we took a quick trip out to Ridge Vineyard. Ridge is at the top of a mountain Southwest of San Jose and the trip up that mountain is a harrowing trip, involving a very skinny road that winds all the way up the mountain. There are some beautiful sights on the way up the mountain, overlooking Silicon Valley. When you get to the top of the mountain and Ridge Vineyard, you feel a sense of relief that you made it to the top in one piece. We tasted a few really great wines at Ridge. The '03 Santa Cruz Mountain Cabernet was my favorite which started smooth and finished spicy and dry. We also picked up bottles of the '03 Ponzo Vineyards Zinfandel, '03 Lytton West Syrah, and '02 Late Picked Zinfandel. I thought about picking up a bottle of the '79 Montebello, but $400 seemed a bit much...I'm going to attempt to let the Ridge wines we bought age a while, since the notes on the wines say that you can age them at least 10 years. I think it's going to be very hard though, since I don't have a safe to lock them in and throw away the key. On our way back down the mountain we came across Picchetti Vineyard so we stopped to have a tasting there. While I didn't like the whites, which were all very sweet, I was actually pretty impressed with their Rose, so we picked up a couple bottles of it. Their reds were a good deal better than their whites, at least as far as my taste is concerned. We picked up bottles of their Pinot Noir and Pavone (mix of Merlot and Cab). After that we went to dinner at Manresa which was about 20 minutes south of our hotel. We arrived early, but we were seated anyway. The dining room wasn't completely full and dim lighting and light music produced an atmosphere was serene and calm. Over the entire meal, service was superb. The wait staff were all a little soft spoken which made it hard for me to hear them, but that's probably because I have horrible hearing from listening to loud music on headphones too much as a teenager. The menu gave us three choices: three courses for $60 with pairing for $42, four courses for $80 with pairing for $52, or the Chef's tasting menu for $115 with pairing for $72. When the waiter described what was on the Chef's tasting menu for the evening, we decided to go with the four courses since most of the dishes he described seemed to be on the regular menu. After we ordered, the staff began bringing out amuses. A strawberry gazpacho with Spanish almonds, served in an espresso mug was "dainty" looking, but a wonderful summery start to a meal. A whole egg with top of shell cut off and layered with cream and maple syrup and other "stuff." I can't even describe this dish, but it was incredible. We were instructed to eat from the bottom of the egg to get the full flavor of the dish and mix the layers of cream together. Shortly thereafter our first course was delivered. I chose the sea bass served sashimi style, topped with olive oil and chives. The flavor of this raw fish dish was sublime: slightly acidic, smoky, yet sweet at the same time. Amy's exact words to describe the dungeonous crab she ordered were, "I've never tasted anything like this. This tastes incredible!" I seconded that. The crab was served in a creamy sauce with red pepper and what seemed to be a blend of spices based on garam masala. In the sauce were cucumbers and oranges that added a sweet flavor to each bite you took. Our second course was paced well. The kitchen gives you time to reflect on the prior dishes and have some conversation between courses. By far, out favorite dish of the night was the Risotto "Biodynamic" with snails. What is Risotto "Byodynamic"? Imagine the most perfectly cooked risotto in the world, made with a slightly longer grain rice than arborio, and cooked in a pesto sauce. I failed to ask what made up the pesto, but I think it was spinach and basil. Add the flavor of snails to that (and this was my first time eating snails, by the way, and I think I'm addicted) and you've got yourself probably one of the best risottos in the country. The other second course dish was local abalone cooked in brown butter, on top of a fried egg white, and braised pig's trotters. Yes, I said pig's trotters. 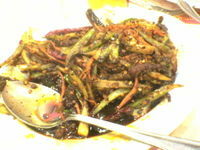 No, there were no hooves on the plate, but there was shredded, perfectly braised pig's feet meat under the fried egg. The abalone had a very meaty texture for a shellfish. I don't think I had ever had abalone before and I'm still not quite sure what to make of it. My third course was the only dish that I didn't moan over. The poularde (or young chicken), wrapped around foie gras and roasted, topped with mini chanterelles was saved by the foie gras but I wasn't blown away by this dish like everything else I had. The details are getting fuzzy as the wine pairings were excellent and I'd already had mine and some of Amy's at this point, but the roast suckling pig was served very different than I am accustomed to. The cut of meat had a layer of gelatinous fat on it that basically melted in your mouth. On the edge of the fat was a crispy, crunchy layer of skin. The meat itself was very tender. For dessert, we had a three cheese plate with a blue, a Pierre Robert, and an aged provolone. I had a Ginger Souffle with plum sauce. At first, I wasn't crazy about the overwhelming ginger flavor of the souffle, but it grew on me as I combined the souffle with more of the plum sauce at the bottom. The fluffy, eggy texture of souffle was ideal. The price of the meal? A little over $300. Ouch! But it was worth every penny in my opinion. The restaurant allows corkage for a fee of $25, so if you wanted to save some money, you could bring your own bottle of wine. Another way to save would be to only get three courses. While it would be hard to choose only three dishes, it is plenty of food. We ended up not being able to finish our desserts because we were so full at the end. Ray's the Classics should be opening soon. How do I know? We're in for a great restaurant in Silver Spring! If a soft opening was that good, it going to be a great restaurant when it finally opens. I'm flying out to San Jose today to meet Amy and go on some wine tours and try the local restaurants. One place I'm especially excited about is going to Manresa which I've heard is fantastic. I've created a live.com map with all the places we'd like to go to in case you're interested. This is my first time in the area, so if anyone is familiar with these places and wants to give some advice, I'm totally open to it. One thing you can count on though, is that I'll be writing about the places we go to, so stay tuned. OK. The list of restaurants participating in Restaurant Week is up again and the usual restaurants are participating. 1789, which is usually one of the more popular choices for Restaurant Week, is NOT participating, although with a new chef and a regular pre-theater menu, I'm not surprised they bowed out. I haven't received many responses to my inquiries yet, but when I do, I'll start posting what the restaurants are offering. If you can't wait to make your reservations, then I'd suggest that you go with one of these suggestions. Corduroy is one of my favorite restaurants in the city due to their superior service, food, and wine. They always offer their full menu during Restaurant Week with a few upcharges, and with most entrees between $20 and $30, Restaurant Week makes Corduroy a very good deal. Vidalia offers most of their regular menu for Restaurant Week. Their food is exceptional, and their wine list even better. Tosca is probably one of the better and more expensive Italian restaurants in the city which makes it a great deal during Restaurant Week. Kinkeads doesn't normally offer dinner service as part of their Restaurant Week offering. Since this is likely not to occur again, I'd take advantage of this while you can. Also, here are some rules/tips for Restaurant Week for you newbies out there. Make sure when you make the reservation, that you tell the person on the phone that you are going to order the Restaurant Week menu. Go somewhere new. Take advantage of this offer and try a restaurant that you wouldn't normally go to. Think about how much you are actually saving by dining during Restaurant Week. Places that offer small plate or tapas probably wont give you the best bang for your buck. Keep in mind that this is one of the busiest times of the year for restaurants and they make their money on volume, so please be sure to be courtious and call to cancel your reservation if you can't make it. This also could be a good time to go to one of those restaurants that ISN'T participating in Restaurant Week. Everyone is crowding into restaurants that ARE participating, which makes it easier to get a reservation at places like Komi or Palena. Just a thought. Restaurant Week menu available here. Select from any Appetizer, Entree and Dessert on the menu. Full menu available here. Offering it's entire menu for Restaurant Week. A "sample" menu is available here. Offering a special full menu for Restaurant Week. Their menu is available on their web site. Click "Events" and then "Restaurant Week". Offering a pre-Restaurant week menu Aug. 7th through 13th. Click here for the menu. Also extenting Restaurant Week Until the 27th. Lunch Menu and Dinner Menu available online. Usually offers a wide selection of normal appetizers, entrees and desserts. Their menu isn't available online but double check the offering when you make a reservation. Usually offers their full menu during Restaurant Week. Double check their offering when you make your reservation. Corduroy always offers their full menu for Restaurant Week. Check their web site for the most recent menu. Offering Restaurant Week option thru Thursday August 24. Special 3 wine flight to go with restaurant for $10. See the Dino Web Site for the most recent menu. Offering a special tasting menu for dinner during Restaurant Week. Click here to see the menu. Full menu available for Restaurant Week diners. See their menus here. Their full menu is now available on their web site. Will be extending their Restaurant Week offering an additional week to the 27th. Their dinner menu and lunch menu can be found here and here. Offering the Restaurant Week menu through August 27th. Lunch and dinner, and brunch menus available on their web site. Their full Restaurant Week dinner menu is available on their web site. Neyla's Restaurant Week menu can be found on their web site. Offering their Restaurant Week Menu from August 1 to September 9th. Full Restaurant Week menu is on their web site. Perry's has an extensive dinner offering for Restaurant Week. You can find their complete menu here. Offering a max of three choices for each course on their lunch and dinner menus, although the dishes sound pretty good. Full menus can be found here. Their lunch menu is here, and their dinner menu for Restaurant Week is here, but their web site doesn't work with Firefox. Their Restaurant Week menu will be available here soon. Sample Restaurant Week menu available here. Offering their full regular menu for Restaurant Week for lunch and dinner. Their menus can be found here. Update: Viridian is extending Restaurant Week through next week as well. Just an FYI. Somehow, I figured out that Spamalot was playing at the National Theater and since Amy is the biggest Monty Python fan ever, I figured I'd never be forgiven if I didn't get her tickets. Through some miracle, I was able to get them for Friday night. We had a baby sitter coming early enough for us to get dinner before the show, but for some reason, the week flew by and I never made a reservation. It was Friday when I realized that I had no idea where we were eating dinner before the show. I've always wondered what Gerard's Place was like. Other than the expense of eating there, I don't think I've ever heard a negative thing about Gerard's Place, but I thought that recently, I'd read something about how Chef Gerard was revamping his menu for cheaper prices and less "stuffy" ingredients that people don't want (I tried to find the article, but I couldn't track it down). There were plenty of reservations available at Gerard's. So many, that pretty much the entire night was open, so I made one for 6:30 PM which thinking back, was cutting it a bit close. We arrived for dinner prompty at 6:30 PM. There were only two other tables filled. Amy and I looked at each other. We were both thinking the same thing. Shouldn't this place be a bit more crowded on a Friday night? The menu is pretty simple. You can either choose Chef Pangaud's five-course tasting menu for $89 a person, or the three-course prix fixe menu for $59. If we had more time, we would've chosen the chef's tasting menu, but we only had an hour until the show started and chose the three-course menu, which has about five or so choices for each course. My only complaint about our meal that night was the wine list. Just about all of the good wines were $60 or more a bottle and over half the wines were over $100 a bottle. I tried to hide the shocked look on my face. So these must be really awesome wines to cost so much right? Well, the wine that I ordered, a 2002 Haut-Mondesir, was $75. Yes, it tasted wonderful and I have to say that I picked a great spicy and dry wine to go with the food we ordered, but when I Googled the wine to see where I could get it, I found that it was available for about $20 a bottle at Cleveland Park Wine and Liquors. Ouch. That's quite a markup. Our first course came out fairly quickly, which I appreciated since we didn't have a ton of time. Amy had ordered the "progressive tasting" of red and golden beets and the presentation of this dish was perfect with four separate portions of beets on a large colorful plate: a traditional layered beet and goat cheese napoleon, a sweet golden beet carpaccio with citrus oil, a smooth and sweet red beet mousse with chopped hazelnuts, and a golden beet salad with candied orange. All of them tasted wonderful, but Amy's favorite by far was the red beet mousse. I tasted this as well and I swear it could have been a dessert. I regrettably ordered the scallop appetizer. I say "regrettably" not because they were bad at all -- in fact, they were quite good. There were two fresh scallops sliced in half and placed on a bed of pureed herb sauce and arranged around a tiny garlic flan. But, when it comes down to it, I compare all scallops that I get to the ones that I get at Ray's the Steaks. I think I would've enjoyed another dish more, like the carrot soup or duck foie gras, since I wouldn't have had thoughts of another preparation which I like more in the back of my head. Our entrees were brought to the tables with the same synchronization as the first course and were even better. I love it when entrees are better than the appetizers and don't leave you flat, dissappointed, and expecting more. The slightly gamey, yet rich flavor of the juicy roast duck that Amy ordered made us think that this was quite possibly some of the better duck in DC. With the duck came a perfect cylinder of mashed potatoes on top of duck confit. We ended up eating through the mashed potatoes to get to the confit. I had the succulent veal chop, which when I cut into, juices ran all over. Desserts were fantastic as well and were the perfect finish to the meal. I should note that we were asked to order our desserts at the same time as our main course due to the fact that they prepare the desserts fresh to order. The lemon souffle that I has was light and fluffy like a souffle should be and the strawberry sorbet and sauce it was served with was the perfect compliment. We finished our desserts and still had time to spare to get to walk to the National Theater. So all in all, service was prompt and our food was delivered promptly as we finished each course. I couldn't really ask for more in a pre-theater dinner. Great food, timely service, but a wine list that's overpriced relative to the food. If I go there again, I might call and ask if they accept corkage, because that would be a way to solve the wine dilemma there. Lingering in the shadows of DC Restaurant Week is Bethesda Restaurant Week, which happens NEXT WEEK, July 17th through the 23rd. While there aren't nearly as many restaurants participating, the deals you'll find are just as good. You can find a list of participating restaurants here, however, I did a little research last night, and here is a little more info about what the different participating restaurants will be offering. Dinner is $30 or $22 per person and lunch is $15 per person. La Miche is offering their extensive three-course dinner menu, which is normally available for $35 per person. Look here for their regular menu. Note: Items with a * are not available. Passage to India is my favorite restaurant in Bethesda. Chef Sudhir Seth is putting his most popular items and a few dishes which are his favorite but not on the menu. Here's there Restaurant Week Menu. The first time I was ever at a Mon Ami Gabi was in Las Vegas. I had a good enough steak there, that when the location in Bethesda opened, I went back again. You'll enjoy their unconventional frites. Click here for their lunch menu and here for their dinner menu. From what I can tell, Grapeseed has their entire menu available to Restaurant Week diner. For some of the entrees, there is a small upcharge, but otherwise it's all there. Look here for a copy of their menu for the week. I found out from David Craig that they will have a few choices from their appetizers, entrees, and desserts, but I don't have any details about which will be available. Those are the only restaurants that have responded so far. Hopefully that helps you make up your mind on where you want to go. I don't know if anyone's noticed, but I'm no longer doing weekly food and wine events posts. Instead, I've been working on a DC Food And Wine Event Calendar using Google Calendar. I've set it up on a new page on my site here. You can "subscribe" to the calendar and have all of the events added to your own (if you have a Google calendar yourself). I'll be updating the calendar as I find out about events, pretty much monthly. If you want your event added, please email jason@dcfoodies.com, and I'll make sure it's included. It's no secret that Joe's Noodle House in Rockville is one of the better Chinese (or Szechuan) restaurants in the area, if not the whole country, but on Friday night, I found myself eating there for the very first time. Amy and I were on our way back from a trip to stock up on formula, diapers and other necessities, so we were looking for a place that was kid friendly and quick, for it was late (about 9-ish) and Noah was going to be getting tired soon. I really had no idea if Joe's Noodle House would meet those requirements, but we gave it a try anyway. I was pretty confident that it would since I know several people with children that love Joe's Noodle House which lies hidden at the back left side of it's Rockville Pike strip mall location. As I suspected, Joe's Noodle House was everything we needed for a night out with Noah with child seats, a casual atmosphere, and little child plates and spoons just for children. We made a rookie mistake though. We sat down and waited for a server to come and wait on us. And waited. And waited. "Do I need to put down my menu?" I was thinking to myself. Then just as Amy noticed the sign up front that said "Order and Pay Here", one of the servers came up to us and pointed out that we needed to order up front. Oh, right. Duh. Like many Chinese restaurants, the menu at Joe's Noodle House is large with an extensive list of noodle dishes and house specialties. You'll find the typical garlic or sesame chicken, but then you'll also find dishes like shredded pork tripe, or homemade bacon with leeks. Even after looking at the menu for as long as I did, I still couldn't decide what to get. My final choice for my entree was a little unwise. Let me give you one tip. When you order a dish, and the woman at the cash register says, "Oooh, that's a very spicy dish. Do you want me to have them tone that down a bit for you?" I made the mistake of saying "no" when I ordered the Szechuan Spicy and Dry Beef Saute and I still feel my stomach lining of eroding. I love spicy food, but this was hot as hell. There were so many peppercorns that my tongue turned numb and I couldn't taste the food I was eating, making the dish almost unenjoyable. But, in the end I got what I deserved...I guess. All of the other dishes were enjoyed completely: a spicy cellophane noodle with finely ground pork, a unique salad appetizer with chopped leak stem, ground pork, black beans, and jalapenos, and some fluffy steam buns, which were the sole, mild dish that we ordered. I couldn't get enough of the cellophane noodles, which came out very hearty and full of the flavor of the pork and whatever liquid they were cooked in. The three appetizers and two entrees ended up being far too much food for the two of us, and we ended up taking a lot home. We could've easily eaten there for under $25, which makes Joe's Noodle House one of the best bargain restaurants that I've eaten at in a long time. There isn't a single dish on the menu for over $11. Even the whole steamed fish is $10.95 and I would've ordered that instead of the spicy beef, but I hesitated because I wondered how good an $11 whole fish could be. I'll probably order it on my next trip back though. Parking: Plenty in the strip mall parking lot. Baby friendly rating: 4 diapers. Child seats and a casual atmosphere make this a great place to bring a baby.